The man, who asked only to be named as Paul, created the innovative design as a Christmas card for friends. Stations include 'We Three Kings Cross St. Pancras', 'Holyborn' and 'Myrrhgate'. Others listed include 'Mornington Present', 'Charing Frost' and 'Winterloo'. But one stop which did not require a name change was Angel in Islington. 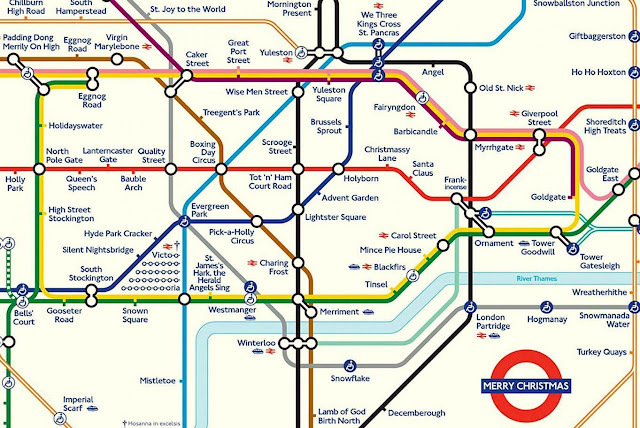 The map's creator, who tweets as @bitoclass, said he made the map to send out to friends and family, adding: "I also sent the idea to the London Transport Museum shop in the hope they'd like to mass produce them for Christmas but they didn't reply, sadly!" Unfortunately those looking to make use of the map on Christmas Day will be disappointed as the network is closed.